Pompon dahlias take on a fascinating form, looking almost perfectly spherical. It is a tribute to Mother Nature that such a mesmerising flower can exist and grow so well in different regions and climates. 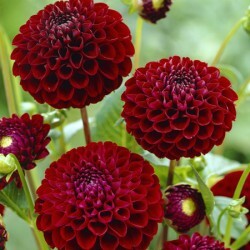 The pompon is similar to a ball dahlia, but is more rounded with double spherical blooms. Its petals are totally curved inwards to create its tight golf ball-like form. The flowers are not usually any larger than 2 inches or 5 cm across. Pompon dahlias feature strongly in gardening competitions and exhibitions due to their incredibly intricate form. Gillwood Violet – this is a pompon dahlia with violet petals which have a slight hint of lavender around their edges. It grows to a height of 90 cm (3 ft) and has dark green foliage. The flower size is less than 5 cm or 2 inches wide. Noreen – this is a very good pompon for exhibition purposes and has pretty pink petals which appear on an outer edge of white. This plant has green foliage and grows to a height of 110 cm (3 ft 7 inches). The flowers are less than 5 cm (2 inches) wide. Martin’s Yellow – as the name suggests, this is a yellow pompon dahlia which seems to fade to a more delicate hue towards the edges of the petals. The foliage is green and the plant can reach a height of 100 cm (3 ft 3 inches). The flowers are 5 cm (2 inches) wide.